It's all about hitting things even the flavour text. This book provides a complete weapons-based martial arts system for practically every weapon in the game and a few things you wouldn't even recognize as weapons (like an immovable rod). 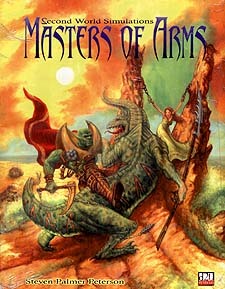 Masters of Arms includes over 300 special manoeuvres, spread across more than 30 classes. Masters of Arms focuses on unusual weapons and those who master them. Combination manoeuvres give you many different ways to devastate things and defensive manoeuvres give you something to do while the monsters try to eat you. All the classes are designed with maximum flexibility and customizability in mind and most of their special abilities can double as new feats, so that those who don't wish to specialize in a prestige class can still expand their library of actions. For gamemasters the Alpha Beast provides a convenient way to upgrade a monster for close in fighting, whether using claws or teeth or tentacles. And the telekinesis master can make fighting demons a very different experience. In addition Masters of Arms includes a combination manoeuvre construction system. For those gamemasters, players, and game designers willing to risk their sanity, the construction system can work quite nicely but Second World Simulations will not compensate you for mental anguish or possible psychiatric bills.